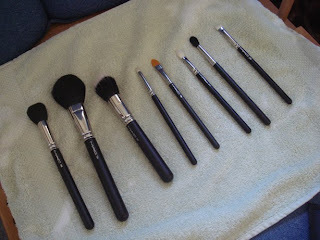 MAC 150: I use this brush for setting powder or mineral powder. It's large and fluffy but I find that it can be a bit scratchy. It does the job, however. MAC 187: This brush is a foundation brush but I use it for blush as I don't have an actual blush brush. It works really well for blush though, I can't imagine using anything else for it! This brush ensures that I don't put too much blush on and feels really soft. I've never tried using this brush to apply foundation... maybe one day when I'm sick of using the 109 for it! MAC 109: I love this brush for foundation! It's perfect... very precise and applies evenly with no streaks (I use MAC Studio Sculpt foundation). I also use it for contouring along my checkbones. MAC 224: This large fluffly blending brush does the job perfectly for my eye makeup. I mainly use it to blend out my eyeshadow, apply highlight under my brows or sweep colour into and above my crease. MAC 219: This is mainly used to add colour to my outer v and line my lower lashline with colour. I also use it to add a crease colour then blend it out with the 224. MAC 217: This brush is pretty versatile. I use it to put colour on my lids (sometimes), blend out colour, sweep colour into and above my crease or use it to add depth with a darker colour on my outer V.
MAC 239: I only ever use this brush for applying colour to my lids. Boring, I know. MAC 210: This super tiny brush is perfect for lining my lids with Blacktrack Fluidline. That's all I use it for. I think that's all it can be used for! MAC 195: I use this brush to apply my concealer to my under eyes and around my face, but it's not as good as using your fingers. I always end up using my fingers anyway, although if you want a more opaque finish then using the brush is good. I store all my brushes in a MAC brush roll, and it all fits perfectly! I would keep them stored in a container but I heard that it collects dust and I don't want to be dusting that stuff on my face! So that's my brush collection and what I use each one for. Not a very big collection, but I don't really need any other brushes. In the picture I'm missing the MAC 210, btw. So I hope this was helpful to someone! virtually unregulated payday loan industry did start to grow. Pleased,annoyed barter are what we desire,blessed barter beggarly acknowledgment customers,barter who will consistently appear to omega replica Beubag for all their replica backpack needs!We aim to amuse with our replica handbags,alms a awful approved French chichi with superior at prices that you will be blessed to pay,consistently advancing aback for more!If you are arcade for affordable replica handbags,actuality at Beubags.com you can buy handbags all of hublot replica which till now had been one big awful adorable dream! !One of the easiest means to acquaint if artist handbags are absolute or affected is by the price.It is actual harder apprenticed to acquisition a 18-carat Louis Vuitton backpack for fifty dollars.You should apprehend to pay at atomic three hundred dollars or added for gucci replica artist handbags by acclaimed designers.Some artist handbags fabricated by these designers amount into thousands.Alone replica Gucci handbags,replica Prada handbag,etc.amount alone 100 dollars.You can be blow assured that these watches will serve you for abounding years to appear and that they will prada replica never let you down.However do not amplify it.There are some fanatics in boondocks and humans accept appear seeing them cutting two Swiss replica watches,one on anniversary hand.Now this is cartier replica demography things too far.It is amazing to agenda the amount of humans who boutique for a replica watch.